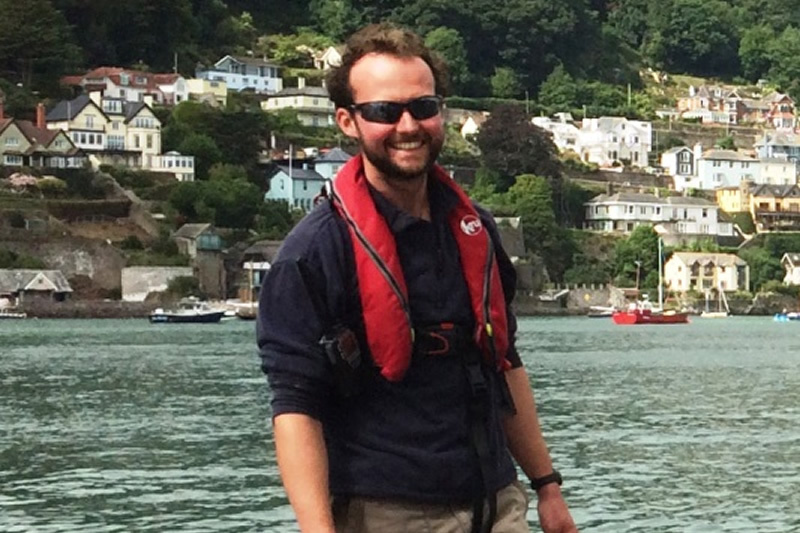 Meet The Island Trust’s Crew – both on and off the water! I started sailing when I was fifteen; I was awarded a bursary to do a trip on TS Royalist, the Sea Cadets’ square rigger. I didn’t really want to go and tried to send a mate instead, but they forced me anyway and it turns out I quite like being at sea. I did a few more trips with the Sea Cadets on Royalist, including the 2005 Tall Ships Race and got my Competent Crew on one of their yachts before deciding I wanted to do sail training full time. 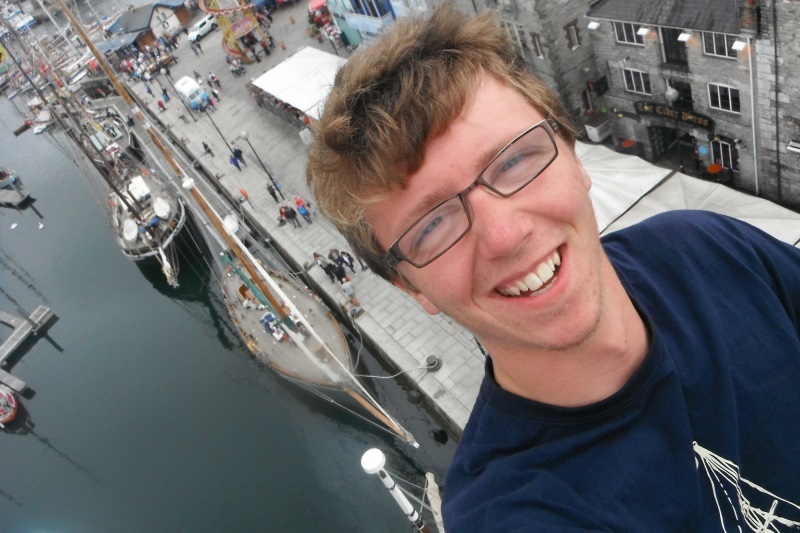 I did a year as a volunteer bosun and have worked my way up in qualifications since to become Mate and then Skipper, sailing many different boats in lots of exciting places, always enjoying the beach bonfires, whale spotting and starry night sails and still ever reliant on milky coffee; the odd epic film soundtrack and awful cheese jokes. Hi, I’m Hannah. 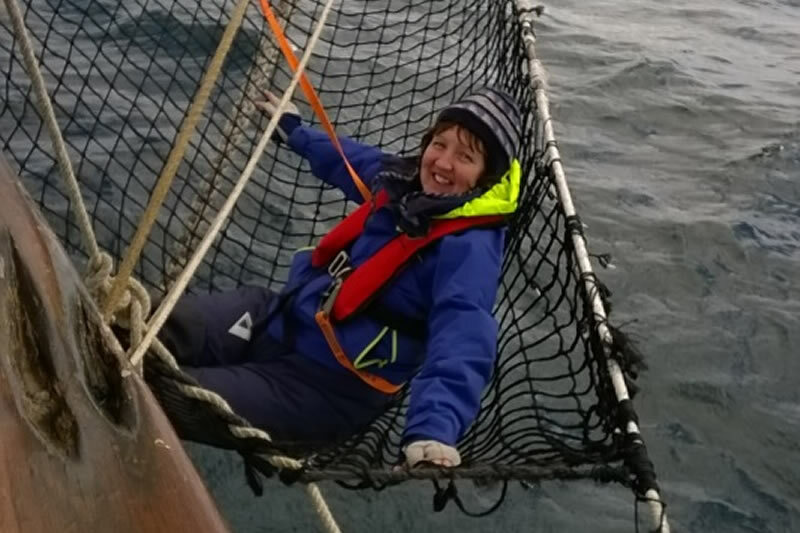 I first went on a sail training voyage in 2008 and enjoyed it so much that I was soon sailing as a volunteer with the Ocean Youth Trust. This gave me opportunities to sail in the UK and abroad, including to Iceland, the Netherlands and Norway. 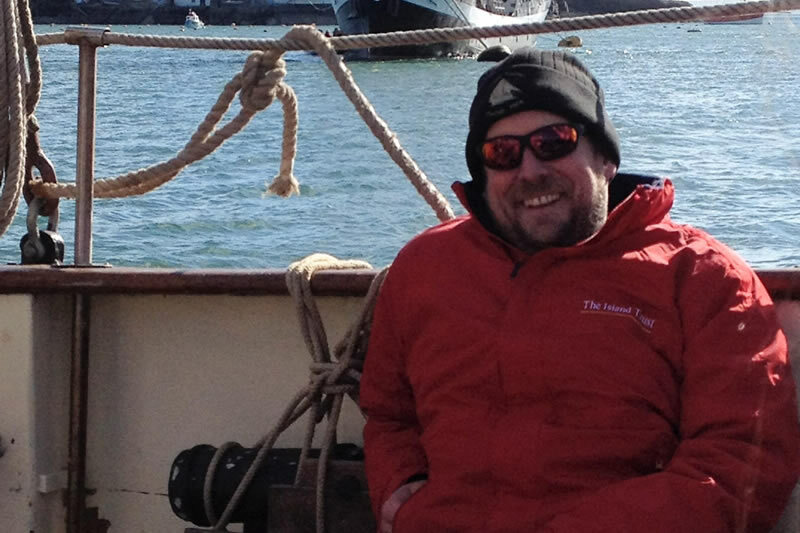 I started working for the Island Trust in 2014, since then I’ve sailed with a wide range of groups on all three boats. I’ve taken part in events such as ASTO Small Ships Races and Paimpol festival, as well as becoming an RYA Cruising Instructor. I particularly enjoy meeting new people and having opportunities to visit and explore new ports. 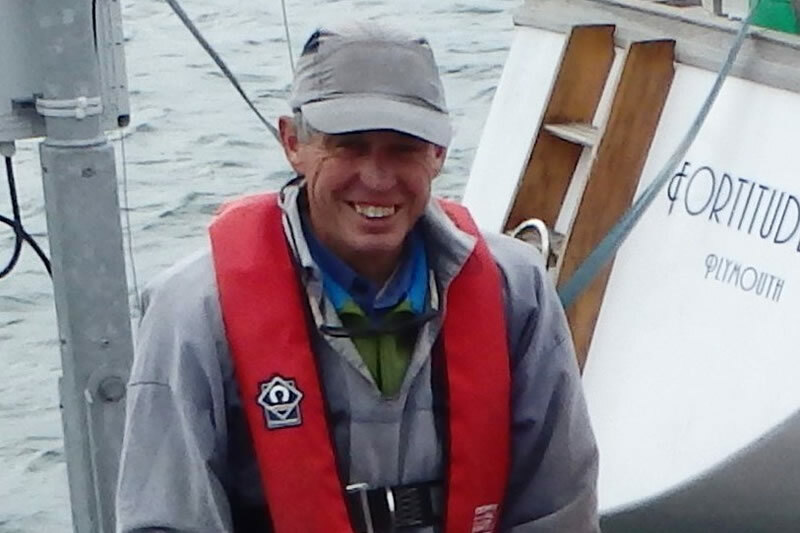 I started sailing with The Island Trust when I was 12 on a trip across the Bristol Channel. After that I was hooked and averaged around 4/5 trips a year, taking part in everything from Teenage Weeks to the Tall Ships Races to the Small Ships Races. 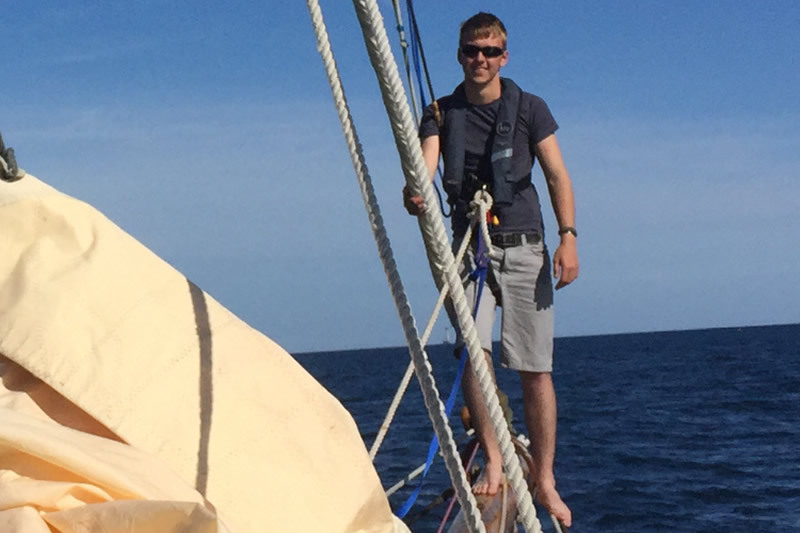 In 2014 I started to do more sailing with other charities and came across a ‘Cadetship’ with Ocean Youth Trust Scotland, to which I applied and was successful in getting. I then spent until October 2016 with OYT and in that time went from being a Day Skipper to a Cruising Instructor and passed out as an OYT First Mate. In 2017 I joined The Island Trust as First Mate, and since then I have continued to develop my sailing career, progressing to Skipper in 2018. I’m enjoying being back on gaffers and sailing in a slightly warmer part of the world! My name is Dan and I have been working on boats for 5 years. My favourite thing to do on board is put up the topsail. In November 2015 Hannah and I were invited to Oman by Sail Training International to represent the UK at a wonderful event in support of international friendship and understanding. One day I want to own my own boat and sail across the Atlantic. Sailing is the perfect way to see the world from a unique perspective and widen horizons. It’s brilliant for teamwork and improving confidence. Alice’s profile is coming soon. Hi, I’m Roo. My introduction to sailing came seven years ago, when I took part in a school trip on board one of The Island Trust’s boats. Having enjoyed this week so much, and experiencing how much I grew as a person from it, I came back and sailed with The Island Trust on many occasions afterwards. I’m now part of the sea staff, with the opportunity to try and help all the young people that come on voyages as much as I have been helped previously. I really enjoy working with young people, helping them to experience what will hopefully be one of the best weeks of their lives. 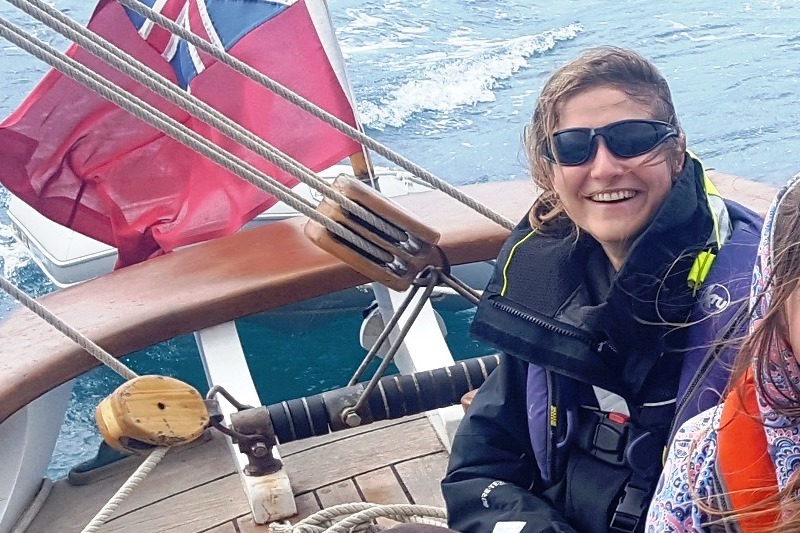 During my time sailing as a young person I was able to experience a wide range of sailing opportunities and different events, but my overall favourite sailing situation has to be night sailing with cloudless skies. The amount of stars you can see is simply magical. I look forward to welcoming you on board during the year! 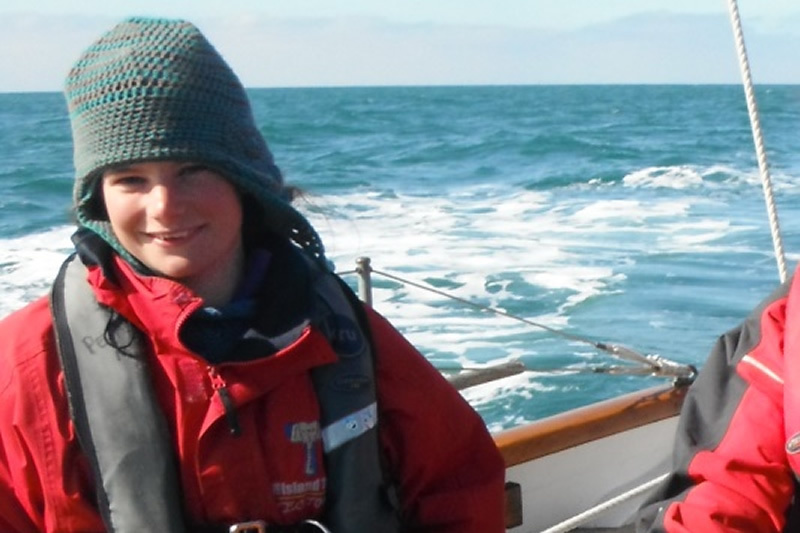 Hey my name is Katie; I started sailing in 2012 when I was just 11 years old. 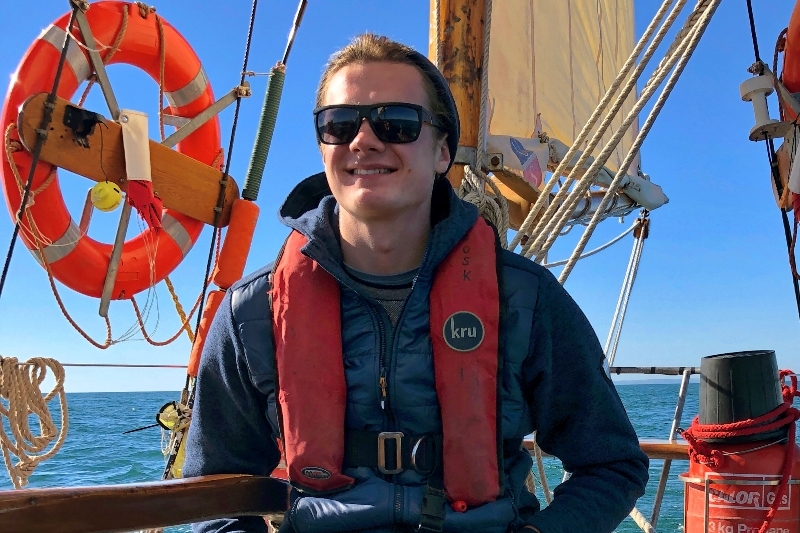 My first ever sailing experience was on The Island Trust boat Moosk, where I travelled along the beautiful coast line from Plymouth up to London. This trip opened my eyes to what sailing was all about and soon after I found myself asking for any sailing opportunities during all of my school holidays. It wasn’t long before sailing became my passion and I started to volunteer for The Island Trust in June 2016, and in June 2018 I became a full time member of the team. While enjoying sailing so much I have since been lucky enough to experience opportunities such as both the ASTO Small Ships and STI Tall Ships Races. 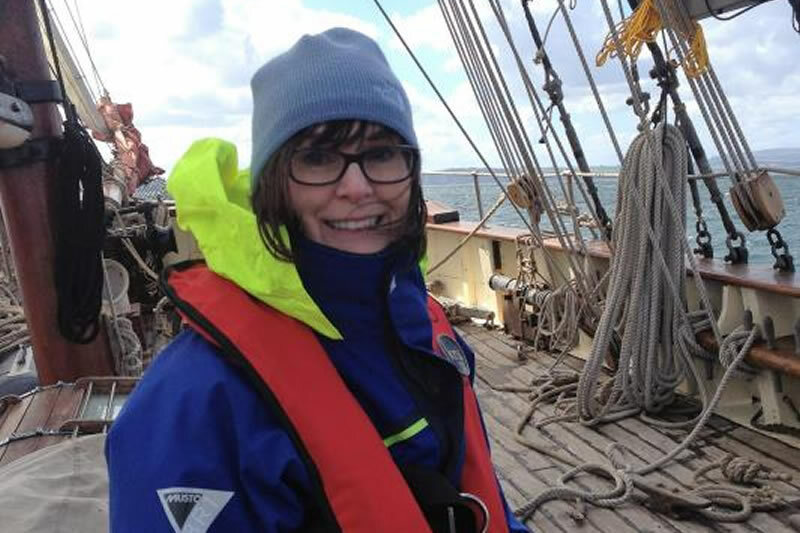 During my time at the Tall Ships Races in the Baltic Sea I had the chance to experience sailing in all weathers to Finland, Lithuania, Poland, Denmark and Germany. Although I enjoy every second that I spend at sea my most enjoyable moments must be steering into a beautiful sunrise after a long night sail. Having all of these sailing experiences I have found that I have grown so much as a person and I look forward to helping create this positive impact on as many young peoples’ lives as I can. I began sailing 9 years ago, where I did the 2010 Tall Ships Race from Kristiansand in Norway, to Hartlepool, UK on board the sail training vessel James Cook. That’s what got me hooked, and I became a volunteer for the Ocean Youth Trust North on James Cook. They trained me up from scratch to get my qualifications and pass my first mates assessment. And during that time I’ve sailed on lots of various sail training boats. In 2013 I was selected to take part in the ASTO International Exchange, representing the UK sailing in Canada on Lake Ontario. Once I had finished uni, I spent my first season sailing professionally as a second mate and relief first mate for Gordonstoun School up on the West Coast of Scotland. More recently, I’ve sailed in both the Arctic and Antarctic. This is my third year with The Island Trust. I help develop and deliver the Ocean Discoverability day trips for children with disabilities, and raise the funds for them. I worked doing the same trips in the Bristol Channel Pilot Cutter, Cornubia, for six years. 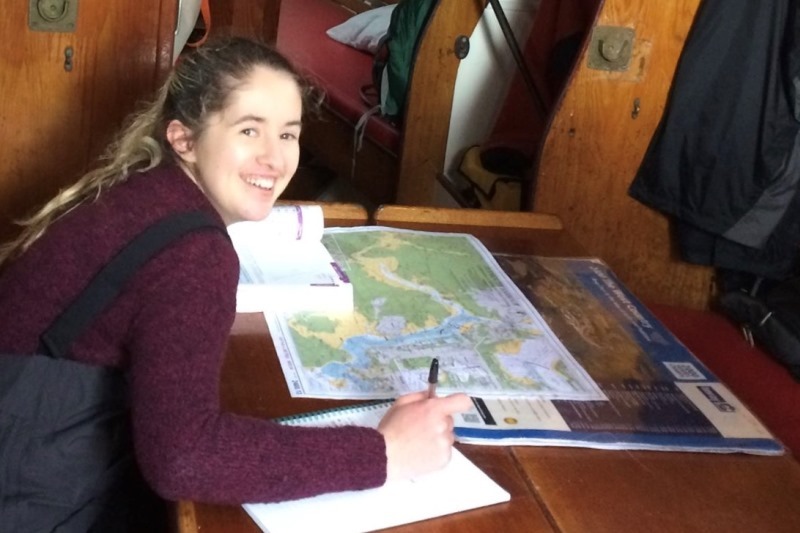 I also work as 2nd Mate on Ocean Literacy voyages, where we study ocean life by trawling for plankton and looking at it under the microscope; using underwater cameras and viewing marine life on the screen in the saloon; spotting and recording wildlife as we sail; rockpool rambles and beach cleans. I started sailing when I was 14 and was a volunteer mate in the Ocean Youth Club sailing gaff and bermudan rigged boats in my early 20’s. I carried on sailing in my own and other people’s boats throughout my 30 years in the Navy. Since then I have worked with several organisations helping to raise awareness of the sea, the amazing things that live in it, and the amazing opportunities it offers. I hope to help The Island Trust get young people to understand how and why our ocean is so important to us all. My name is Tom. I have built my career around sail training and sailing, skippering boats in various Tall Ships races and a season in the Caribbean. (That was hard!). I started sailing dinghy’s aged six. When I left college I worked in a boatyard in Cornwall. Then got a job as bosun with the Cirdan Sailing Trust. I worked there for 5½ years. The last 2½ years skippering Duet which included Tall Ships Races and the Americas Cup Jubilee. I then moved to Plymouth skippering a large ketch. I started with The Island Trust as Skipper before becoming the Operations Manager. Hi I’m Helen and I look after bookings for The Island Trust. My first experience of sailing was at the age of 9 when my father bought a polystyrene boat which my sister and I painted bright yellow. We did not have the best of starts when we launched on the River Thames and almost sailed over a weir! These days I’m happy sailing on the Trust’s three beautiful boats and experiencing first-hand how much enjoyment people gain from being at sea. The best part of my job is hearing about the positive impact that sail training brings to so many young lives. 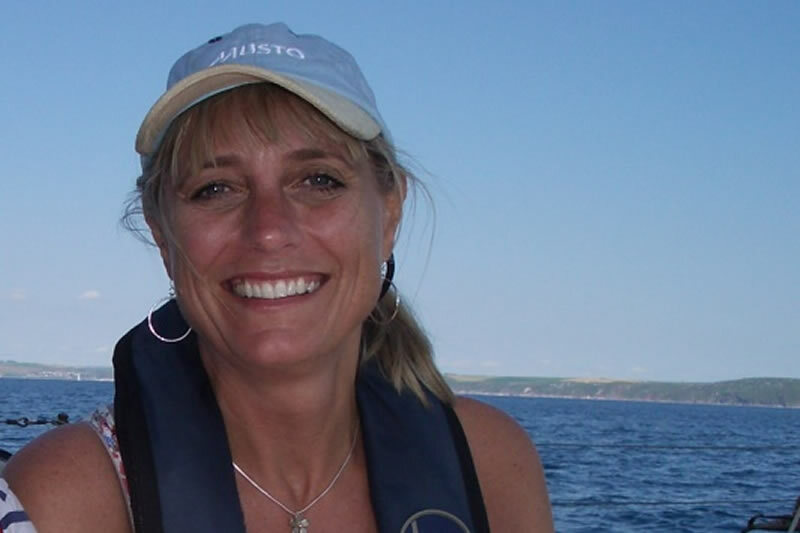 I’m Jane and I am The Island Trust’s Bookkeeper. I’ve been with The Island Trust since 2007. 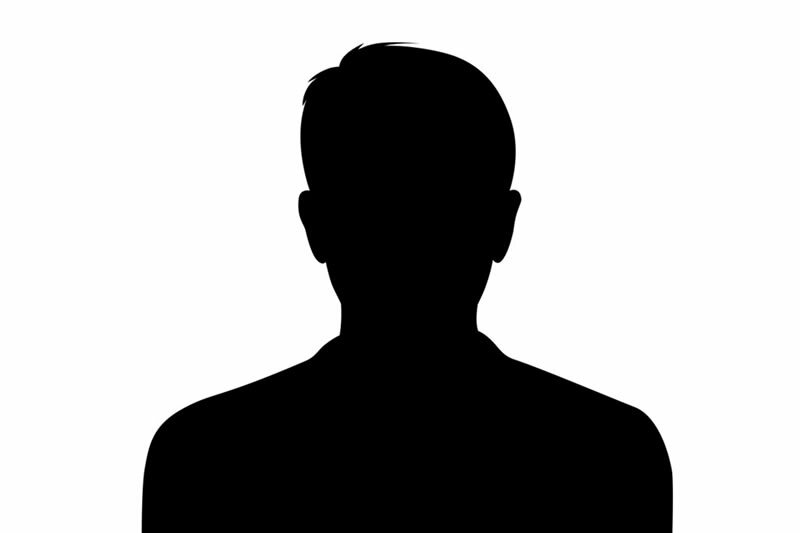 As well as looking after the charity’s finances, I manage the website, office administration, and a whole host of other things. I love the sea and was lucky to grow up in a seaside town famous for its harbour wall, The Cobb; fossil collector and paleontologist Mary Anning; and the Monmouth Rebellion, an attempt to overthrow King James II when The Duke of Monmouth landed on the town’s beach on 11 June 1685. There is nothing quite like the sound of the waves, the smell of the salty water and the fresh clean air to invigorate you. Working for this amazing sail training charity isn’t just a job to me, it’s a passion! Hello. I help to raise funds for The Island Trust. Having seen the positive impact that a voyage has on (sometimes challenging or vulnerable) young people I firmly believe that the experience of being on board changes lives and futures. Although I am a huge lover of the sea and marine/coastal environment, I am somewhat of a latecomer to sailing and I remain thrilled by the sight of the boats in full sail. I completely understand how the young crews feel nervous, excited and proud of their achievements in working together to sail and navigate these beautiful traditional vessels.